a Trinity of music, faith and family. Christmas. A time when we gather with family and friends. A time where love, joy and happiness out weighs the horrors that life can some days bring. A time for peace. No matter what your beliefs are, we celebrate this time of the year for one reason and only one reason - the birth of our Lord and savior, Jesus Christ. Everyone has heard the story at least once in their lives. Someone, some where has shared with you the story of the stable, the shepherds, the wisemen and the birth of a child who would be king. Now think about the story of Christmas and think of the word Trinity. Mary, Joseph and baby Jesus. The three wisemen. Even the holy family, the shepherds and the wisemen. Let me share with you another story...A long time a go, but not as far back as the first Christmas but more towards modern day, a man was glorifying the Lord through music when he saw a beautiful woman. Time had gone by and these two had fallen in love and got married. They kept the belief of Trinity close to their hearts, for it was them and God. Then came their first born, a beautiful daughter. Again, the Trinity of the three of them was kept close to their hearts. Their son arrived not to far behind, and the Trinity still was there with their children, them and God. A second daughter would make it even more so. For it was the Trinity of three children, for which they were blessed. But it was also the Trinity of them, their children and God. The father, Mike, came from a musical family. He began playing guitar at the age of six. Through the years, he developed a talent for singing and became a gifted song writer. The mother, Lisa, also came from a musical family. Her and her sisters enjoyed singing and playing the piano while they grew up. As a young adult, Lisa earned a Master’s degree in Vocal Performance. Together they created a world filled with music. For music was always a staple at their house, especially around Christmas. At the age of twelve, their eldest daughter Sarah wanted to learn how to play the guitar. “It wasn’t really until I came along - when I turned twelve or thirteen. When I came to my dad and I wanted to learn to play guitar.” tells Sarah Harris of Trinity River Band. “So, that’s kind of the beginning stages of what eventually became of our family playing together. “We went to a Bluegrass festival. Josh wanted to learn to play banjo. Brianna, my little sister, she was still very young - she was five or six, maybe even younger than that. So she was still too young to be interested in playing and be a big part of whatever we were doing when we first got started. But now, she’s our full time fiddle player. At twelve years old, she’s a season professional. At the time that I was just getting started, she’s already so accomplished at twelve-years-old. It just kind of fell into place after that. I know it was God’s plan for our family. “My parents wanted to do music together. They wanted me to be a big part of their lives because, it meant so much to both of them. They both just loved music with a passion and wanted to do that. It never really came true until I started to play guitar, Josh started to learn how to play his instrument, then mom kind of got roped into playing mandolin at first. So that was the beginning of the configuration of our band. 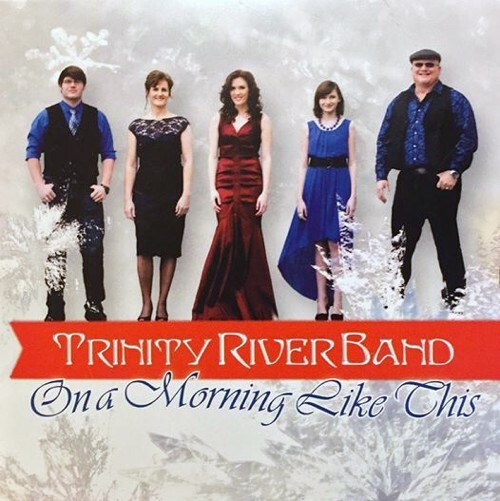 We were first introduced to this family, who call themselves Trinity River Band, when they released their album Better Than Blue on Orange Blossom Records in April 2014. The album consists of twelve beautiful songs including “Jacob’s Ladder,” “My Heart Will Find It’s Way To You,” “Steel and Blood,” and “Willie And Mary.” The album also produced “A Sinner’s Prayer,” which was nominated for the Spirit Award’s Song of The Year. This album captured the attention of Bluegrass audiences world wide. Their music is often heard on SirusXM satellite radio among other Bluegrass stations. Trinity River’s style is a modern mix of traditional Bluegrass, seasoned instrumentals and pure southern vocals. They draw from their strong family bond, faith and talents to bring forth a beautiful sound that rides the waves of life. This year, the Harris family wants to help enhance your Christmas with the release of their new Christmas album On A Morning Like This. The album opens with a beautiful rendition of “I Saw Three Ships.” Performed in a classic Irish feel, this one captures the listener’s ear making you beg to hear more. The group adds just the right instrumentals, including a penny whistle, to bring forth a very beautiful, new arrangement to this classic Christmas carol. The album continues with “What Child Is This?” The family performs this in a slightly upbeat melody but classic feel. It’s Mikes deep baritone vocals that brings new life to this classic carol. Many artists who record Christmas albums want to include many of the favorite classic carols. With time so limited, entertainers will combine several carols to create beautiful medleys. Trinity River creates a beautiful medley that they call “A Christmas Medley.” This medley opens with a classic soulful performance of “O Come All Ye Faithful.” The melody picks up as they continue with “Hark! The Herald Angels Sing” and ends with “Angels We Have Heard On High.” The Harris’ transitions between the three songs is flawless and quite entertaining. Every once in a while a new Christmas song is brought to us. Written by Sarah Harris, “This Christmas” captures the essence of what Christmas is truly about. Performed as a gentle ballad, this song captures the love that this season can bring. This is the first of two songs that we pulled to hit our list of Top Songs of 2014, while earning a nomination for the Spirit Award’s Song of Year Award and Spirit of Christmas Award. Brianna lends her youthful vocals in a beautiful version of “Silent Night.” For years, I have been searching for the best version of this ever popular classic carol. It’s the youthful vocals mixed with just the right background vocals that draws this to the forefront of the list of top versions of this song. This album contains another new carol for us to enjoy. Written by Lisa Harris, the title track, contains a beautiful message of faith as it shares stories taken from the Bible. Performed in a classic traditional country feel, this is certainly a song that one can enjoy throughout the entire year. What is so amazing about this album is the unique musical arrangements that the Harris’ bring to these classic Christmas carols. Case in point, in “We Three Kings” the family includes a beautiful guitar riff throughout the entire song. As the song progresses they add the upright bass, banjo and give it an Irish tint with the Bodhran, thus giving new life to this old song. My only complaint on this album is very minor compared to the vast talents that are featured on this beautiful album. My complaint is their choice to perform “The First Noel” in more of a fast paced beat. I believe that if they were to slow it down just a tad, they would have nailed the song perfectly. Again, this is minor. The song still sounds beautiful as is. The ninth cut on the album is a version of “O Holy Night” that will bring you to your knees. In all of my years, I have never heard such an incredible version as this one. Trinity River captures the feeling of what the first Christmas was truly like with a simplistic acoustic guitar melody mixed with the accompaniment of master vocalist Lisa as she performs it with such angelic vocals. This is as close to hearing heavenly angels sing as we can get. The album closes with a song they call “God Rest Ye Merry, Gentlemen.” However, this is a beautiful medley that includes “Carol of The Bells.” Performed in an acoustic instrumental, with an Irish flare, this is such an artistically defined arrangement. It’s pure magic how the two songs are layered to create one beautiful Christmas carol. This is another that will hit our list of Top Songs of 2014 while earning a nomination for the Spirit Award’s Song of The Year and Spirit of Christmas Award. This album truly captures the spirit of Christmas within the notes and melodies played. It gives off the aroma of family while it shares the magic of the season. The Harris family? Well they have a close bond with each other. For them, it’s family that comes first over their musical careers. They are not perfect, but who is? A family who works together, stays together. If music is known to bring people closer, then the Harris’ are tight. It’s no wonder why they call themselves the Trinity River Band... for their music flows as magically as a river that flows through rocks. Water that cuts through even the hardest rocks, that leaves a mark like no other. Their music leaves a mark on your heart and soul, like no other has done before. Trinity? Well it’s found in the three children. It’s the parents, children and their faith. But more so it’s found in the connection of the Harris’, their music and you.